The big fat Eid-ul-Azha movie clash that transpired over the past week was bound to have its repercussions. In a cinematic landscape that was slowly bumbling forwards on the strength of a few mediocre local releases, three major producers decided to release their movies simultaneously. Suddenly, three major contenders had swooped in, their sights set on that one festive weekend which tends to generate profits: ARY Films with Jawani Phir Nahi Ani 2 (JPNA2), Hum Films with Parwaaz Hai Junoon (PHJ) and Filmwala Pictures with Load Wedding. It was only inevitable that while profits would run high for some, they could possibly take a downslide for the others. According to various cinematic figures, JPNA2 is leading with box office collections of over Rs 25 crores globally within five days of its release. PHJ followed with earnings of Rs 12.684 crores within four days with Load Wedding surprisingly bringing in just Rs 6.5 crores in the first four days. These numbers are quite unexpected for one expected Load Wedding to fare much better at the box office. The movie is helmed under the banner of Filmwala Pictures by Nabeel Qureshi and Fizza Ali Meerza, the duo that has earlier churned out hits like Na Maloom Afraad, Na Maloom Afraad 2 and Actor in Law. Given that Nabeel and Fizza are experienced filmmakers, it would make lucrative sense for Load Wedding to be given a fair number of shows. And yet, there is clear evidence that the movie is not being prioritized. 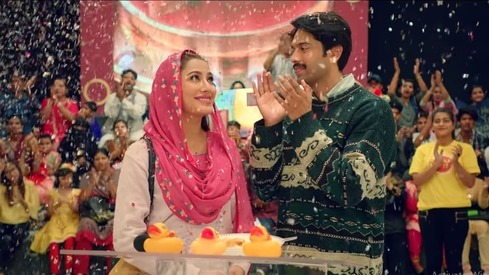 Two of the country’s biggest stars, Fahad Mustafa and Mehwish Hayat, play the main leads in the movie and the music has received well. Released during a long holiday week, the first week’s earning should ideally have been much much more. 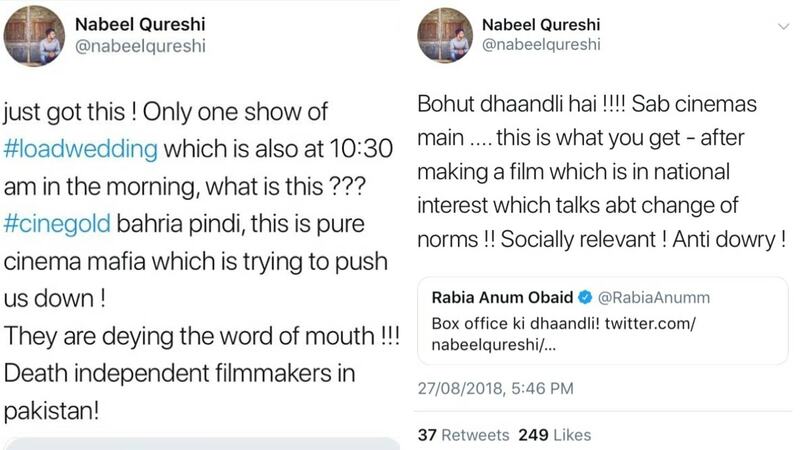 Director Nabeel Qureshi tweeted about there being "dhaandli"
But why would cinema exhibitors deliberately bring down one movie while pumping up the others? 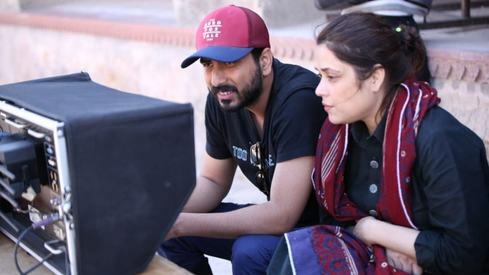 Cinemas earn primarily from commissions on ticket sales and given that Nabeel and Fizza are experienced, well-respected filmmakers, it would make lucrative sense for Load Wedding to be given a fair number of shows. And yet, there is clear evidence that the movie is not being prioritized. One week after its release, the movie already has limited shows in mainstream cinemas. On Sunday 26th August, the movie was only allotted a single 6 p.m. show in Universal Cinemas Multan while JPNA2 was given five shows and PHJ four shows. The cinema schedules for Cinepax Amanah Mall Lahore for Wednesday 29th August and Thursday 30th August have Load Wedding being screened only once at 12.10 p.m. while many more shows – and more optimal timings – have been slotted for the other two movies. At Nueplex D.H.A. 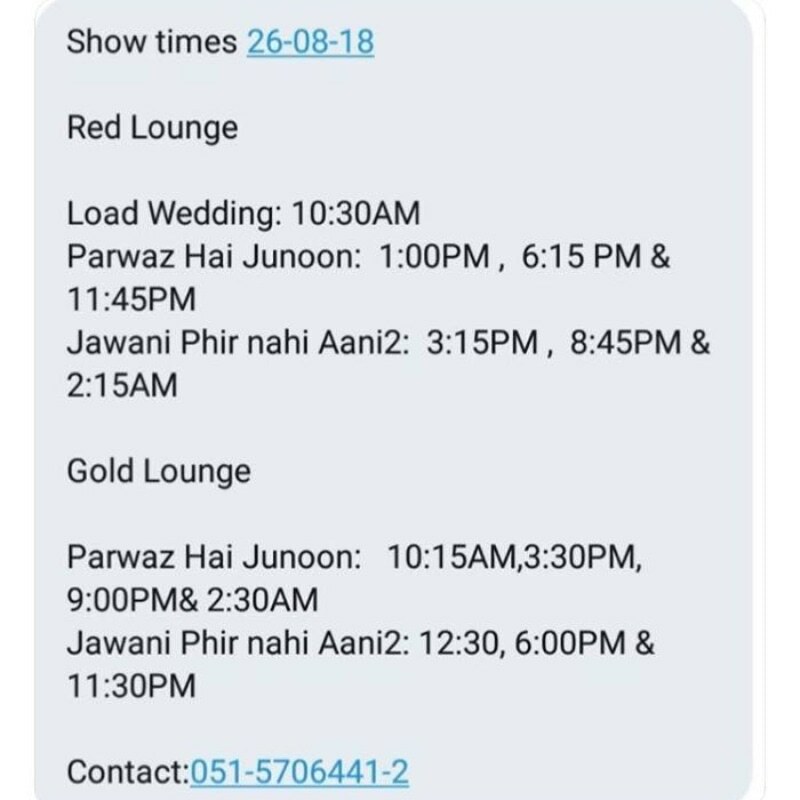 Karachi, Load Wedding has three shows for Saturday, 1st September while JPNA2 has 14 shows and PHJ has nine shows. Nueplex Rashid Minhas Road Karachi, meanwhile, has slotted seven shows to Load Wedding, 14 to PHJ, five to Teefa In Trouble and 12 to JPNA2 for this Saturday. For Thursday 30th August, Universal Cinemas within Emporium Mall in Lahore has allocated 19 shows to JPNA2, 10 to Load Wedding, 15 to PHJ and five to Teefa in Trouble. The Saturday, 1st September schedule at ME Cinemas in Centaurus Mall Islamabad has set aside five shows each for JPNA2 and PHJ, three for Load Wedding, four to Teefa In Trouble and one each to Bollywood release Yamla Pagla Deewana Phir Se and Hollywood movie Kin. 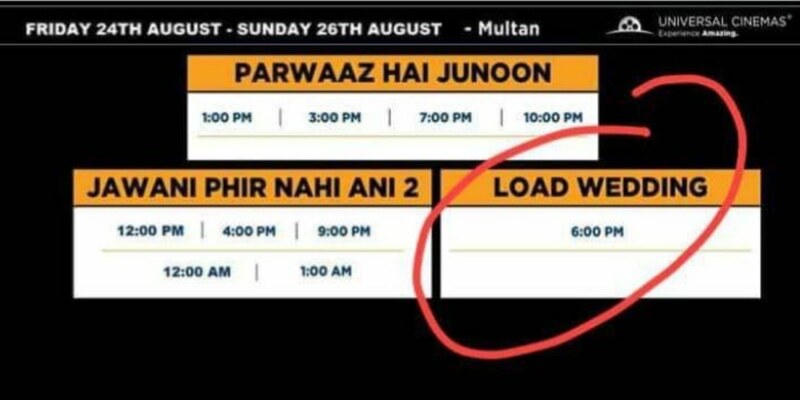 Load Wedding is no longer being shown at Cinepax Faisalabad. There are cases of movies winning critical acclaim but not commercial success. Could Load Wedding become an unfortunate example of this? Are there truly unfair practices at play in this case? 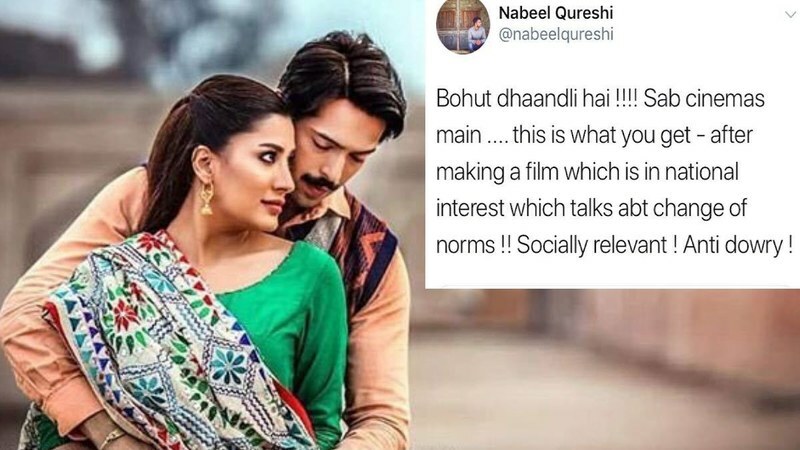 It is likely that sharing its male lead – Fahad Mustafa – with another major release may have been detrimental for Load Wedding. The movie also hasn’t been promoted as much as the other two contenders. The ARY Network has pulled out all stops in promoting JPNA2 while the HUM Network is fully invested in making PHJ a blockbuster. With GEO as their media partner, Load Wedding is also quite visible on TV but the channel is not wholly invested in the movie’s success or failure, resulting in less pre-release hype. It is important to note that while Load Wedding may be suffering in some cinemas, in others – the country-wide Cinepax chain, Nueplex Karachi, Atrium Cinemas among them – there are still a reasonable numbers of shows being allotted to the movie. Perhaps, word of mouth will ensure that ticket sales pick up? And yet, there are cases of movies winning critical acclaim but not commercial success. Could Load Wedding become an unfortunate example of this? Are there truly unfair practices at play in this case? Some very loaded questions right there that may never get answered. I watched it on third day of Eid in Mandi Bahauddin. Fantastic movie and I'm sure it is worth more than all other movies in terms of value. Such a well directed and written story describing every Pakistani boy's and girl's problem; marriage. Totally unfair!!! Promotion definitely fell short for this film while their previous NMA2 was promoted heavily. I couldn't even figure out what this film was going to be about until reviews started coming out. Promotion won't save a bad film (which this one isn't) but you still need to generate hype and get the attention of cinema exhibitors. ARY and HUM are promoting JPNA and PHJ every few minutes while Geo gave LW the occasional mention here and there on news broadcasts. There most certainly was not an equal number of shows though. I hope the people behind the film don't get too discouraged. This was the best movie to come out of the three and was much better than the NMA series. The movie was excellent, I am surprised that it is not getting shows. The failure is in the name! Who would consider watching LOAD WEDDING! This is not suprising. Three is a crowd. The thing is that people are tired of seeing Fahad Mustafa in everything everywhere. He needs to scale things down a bit and do fewer shows, dramas, movies, etc. He may be making his money but we are bored of seeing him. Maybe right time to think beyond releasing movies only on Eid days. With three big release on Eid day this was ought to happen. Nabeel-Fizza duo shall be confident after already pulling off 4 blockbusters. They can release their movie on any weekend and make it a blockbuster. 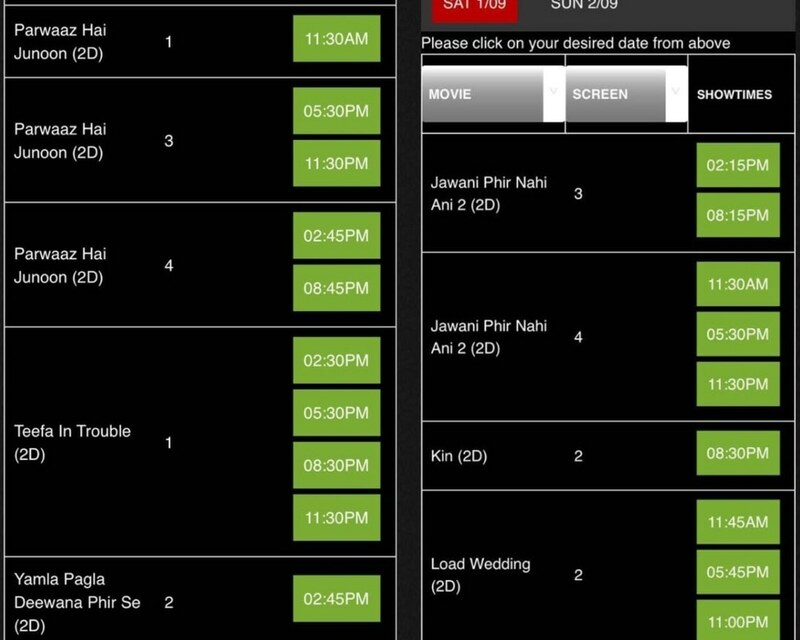 And yes, people also watch movies on normal weekends, provided there are good movies in cinemas. the subject of the movie should be , take in consideration to when the films should be released! Patriotic movies on Independence Day! Eid should have fun films, fantasy, just good time films! Not all films should be released on eid! There is so much corruption all over Pakistan why are we surprised that it leaks into the film business? This is trade. Don't sulk, learn from the experience and adjust accordingly. Moving on ..
Load Wedding, for all its strengths, is still an ethnic movie. You can't expect it to churn out great numbers when put up against Urdu movies. A cinemagoer in Karachi or Peshawar can't understand Punjabi, which a good potion of LW is in. Then why should they spend their money on it? A lot of people are blaming Nabeel Qureshi for his own film's loss because he released it on Eid with other films. Why ther are saying something so ridiculous? Load Wedding was first film to be announced being released on Eid. Then JPNA2. And Parvaz hai junoon was Eid-ul-Fitr release and moved to this Eid. So why blame Nabeel when other films came and took it away from him? It is fault of cinemas who pay attention to big production houses instead of independent fillmmakers even when nabeel made the best film. Load Wedding is a very good movie with great acting, direction and story line. Plus music was good too. The movie is a hit as long as it earns little profit which Load wedding will earn. @Kamil Fahad Mustafa only does movies and his game show. The game show might make people tired of him but he does only one or two movie yearly. Give this movie more show time it will pick up and will be a bigger hit. load wedding was a pure delight! i loved everything about it: the story, production, styling, performances, songs. i haven't seen the others so i can't compare, but it was much better than the first jpna. it deserves to be a huge hit. Unfortunately, i have to say Pakistanis cannot do promotions. My biggest gripe is tha all 3 movies were not given enough shows at my local cinema in England, only one showing per day for around 3/4 days and then taken off completely. @Danish Agree. Where did the dig a name like that. name is a window to which we try to judge what is inside the house. Even name like Parwaz hai junoon is a slaughtered Urdu. : Do they did announce the day of the release 1st, day should have moved the date As the where competing with high budgeted productions. It also suffered from poor publicity. I saw all 3 movies. By far this was better than the other 2. If the had used better camera and post production it would have been a great movie. Having songs in Punjabi language in Urdu movie does not help at all. Maybe this is time to re-think release dates, for my two cents it would have been better to release it a week or two before the Eid. I loved the movie, great job by the entire team. The industry needs to grow up and it will take time to think above greed and reaching short term goals.